Nearly three decades ago, two young men posed for a picture together, both beaming as they stood in front of a gleaming 1987 Mack® RD model. 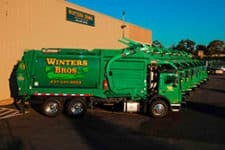 Sean Winters, 21, had just bought his first garbage truck, continuing the family legacy that began in the 1950s and continues today. Jimmy Brown, 25, was a salesman at Gabrielli Truck Sales in Hartford, Conn., and that first truck was just one of many Mack models he has since sold to Winters. Partnerships like those with Gabrielli and Mack Trucks are the foundation of Winters Bros. Waste and Recycling, Winters says. And their bond continues today.